The horizontal radius of the face measured from the heel to the toe or the horizontal plane of the face. This is most commonly referred to as bulge. 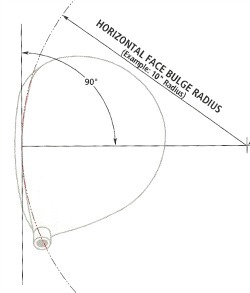 The easiest way to measure horizontal face bulge is with a set of radius gauges designed for the purpose. 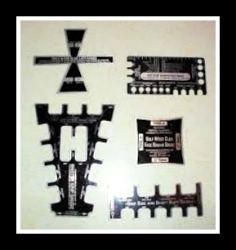 Roger Maltby has had these gauges for years, as you can see below, he pretty well covers everything. The actual performance characteristics best describing what this specification does is as follows: It is the built-in correction or compensation factor which under normal circumstances at impact starts the ball farther to the right on toe shots and farther to the left on heel shots in order to compensate for ball sidespin caused by OFF-CENTER hits. Off-center hits are defined as those hits that are not impacted on the club heads horizontal center of gravity and thus cause clubhead rotation or twisting around the clubhead’s center of gravity and not around the axis of the shaft. The image below really simplifies this. 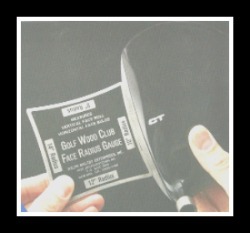 This assume all faces shown above are square to the target and the clubhead path is square to the target at impact. Can you do this? Also, all centers of gravity are in the exact same location. Note: Off-center hits cause the clubhead to rotate about it’s center of gravity causing a sideways movement of point of contact with the ball. This imparts side-spin to the ball which would normally cause an undesirable hooking or slicing effect. Horizontal face bulge is the built-in correction factor which compensates for this undesirable hooking and slicing side-spin by intentionally starting the ball farther out to the right on toe shots or left on heel shots. This allows the hooking or slicing spin to bring the ball back toward the intended line of flight or target. Going Back to the old persimmon days, club makers kept experimenting for years and years. Here is an image of an old persimmon head with a 12” radius. As drivers changed to metal and then eventually titanium, a 10” or 11” radius was used extensively. 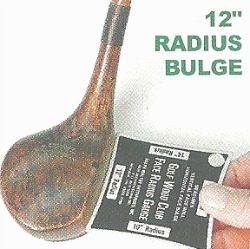 When the eventual size of the titanium drivers of today, were finally controlled by the U.S.G.A., and were huge in comparison to the old persimmon heads, most O.E.M.s kept the 10” or 11” radius. This made the faces of their driver heads appear really rounded or arched . Physics would seem to dictate that maybe this was too much of a radius to keep the desired gear effect on off-center miss-hits, on the much larger modern-day heads. My guess is that this would put more side-spin on the ball, and over emphasize the miss-hits. 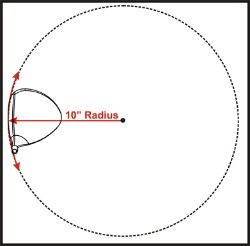 A simple diagram shows that as you increase the radius, the hitting surface becomes a little straighter. When we switched to handling Tom Wishon’s line of driver heads, one of the reasons was that all his 919Thi heads have a 13” radius. After years of hitting these heads and custom building hundreds of these drivers, we can report more fairways hit and dispersions were at least 50% better. Looking down on these heads at address, just gives you a better feeling of not miss-hitting these. Click on the image above to go to a more in depth look at our Wishon 919Thi drivers. 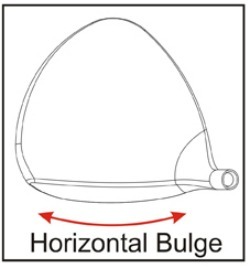 Obviously, this was a great plug for our driver heads, but the purpose of this article was to make you aware of what the horizontal bulge is and why it is there. 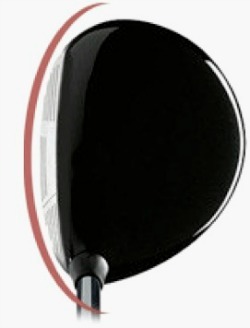 Wishon’s 13inch radius on his bulge plus the graduated vertical roll technology (GRT) makes his driver heads more consistent on miss-hits and keeps that ball in the fairway a lot more often. The importance in understanding horizontal face bulge relates directly to analyzing directional control on off-center hits. During the hitting evaluation phase in fitting analysis, it would be very easy to be tricked by what you actually see the ball doing in flight if this area of club design were overlooked.